After getting engaged in Miami, Sarah and Ronen fell in love with the idea of zen vibes taking place throughout their white gold wedding. 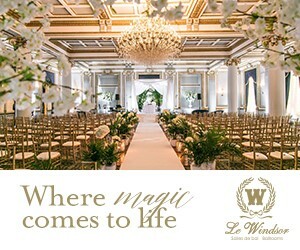 Held at Le Windsor Ballrooms, the celebration began with a floral-filled ceremony that featured two cherry blossoms at the entrance and palms lining the aisle. Later at the reception, rich white and gold decor reflected the beauty of the venue alongside tropical-inspired centrepieces on every table. 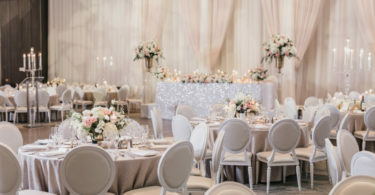 The entire theme came together perfectly to create Sarah’s dream wedding.